All transactions are safe and secure with a reliable history in online purchasing behind each of our associates. Buy the Grumpy t-shirt to own Snow White clothing and merchandise. Of the Seven Dwarfs, Grumpy tends to be the favorite dwarf among fans. Although he seems mean and mad all the time, it is obvious that he has a special place in his heart for the fair Snow White. He might really get angry with everyone else but with her it is just an act. 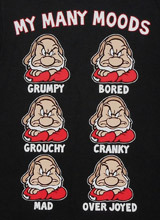 If you think his little charade is adorable then grab your Disney Grumpy t-shirt today. If you're like Grumpy and wish you could be around her all the time, then keep perusing our Snow White tees and gallery. It is full of other Snow White merchandise like Grumpy plush toys! In addition to the Grumpy tee above, browse the Snow White Clothing Gallery for more apparel like men's and women's clothes, kids shirts or hoodies.